Imagine walking along the well-kept concrete perimeter path to the Great Court lawn centered at the distinctive sandstone University of Queensland, when quite unexpectedly it is is crossed by a trail of bark chips strewn across it. My curiosity piqued, I stop and slowly turn around to look at what I had walked over. Other people continue walking and do not appear to be taking any notice of this abstract smear of bark underfoot, as it is cold and at the end of a long university day and people are walking with determined strides to get home. It took me a few moments to visually collate and decode what I was viewing: bark chips and leaf litter strewn in a line across the path next to the Parnell Building, a small pile of bark debris pushed up against a path abutment, a clean garden bed with exposed black soil, and… a large mounded heap of bark and leaf detritus lying in a garden bed within the confines of the Great Court. And then it clicked as to what this unusual sight represented! Of course, it was the “work site” of an Australian Brush-turkey (Alectura lathami)! Belonging to the megapode (or “big foot”) family of birds they are known as Scrub Turkey, Brush-turkey and Wild Turkey (and sometimes misnamed “Bush-turkey”). The male industriously rakes together loose vegetative detritus (leaves, bark) and soil to build mounds of 1- 2m in diameter and up to 1m high so that eggs from a number of females can be laid and incubated in them. 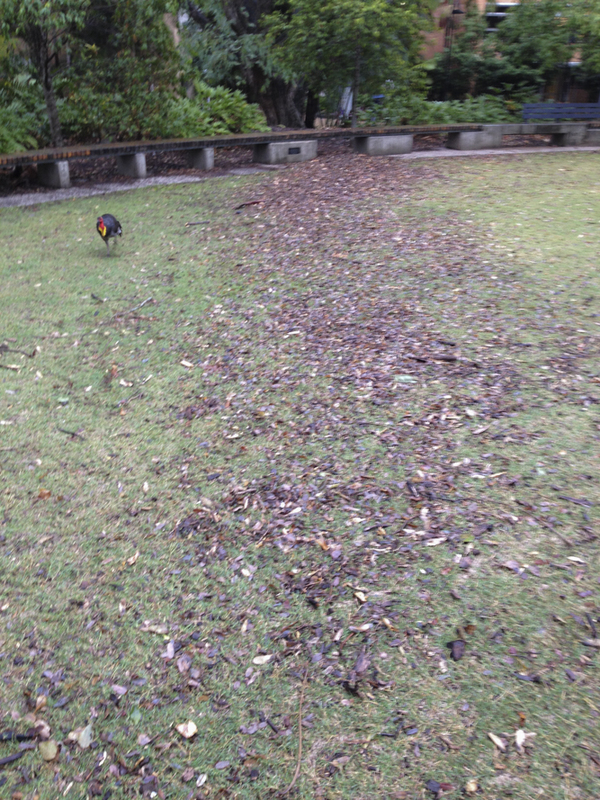 So how does the Brush turkey go about the practice of mound building? Is he an engineer, designer, builder, or landscape architect? Does he use subcontractors? Does he have the qualifications and authorisations/permits to construct a ‘mounded structure’ within a university precinct, does it meet current building codes and standards? As a structure what architectural theory of built space did our brush turkey follow? Was he biased by a quasi-tectonic outlook (I think the loose, unstructured and chaotic pile of bark debris wouldn’t stand up to close scrutiny), were the inlaid eggs the foundation of a nascent stereotomic building approach; (if no mortar or egg-based footings were in place I don’t think they would suffice)? Back at home base all that the resident Brush turkey had to do was to conduct vigilant maintenance of the mound incubator by either adding or subtracting (making it a quantity surveyor too) local litter and debris (including the odd scrap of blue plastic bag) to maintain the requisite temperature of the mound nursery to maximise egg-hatching success. 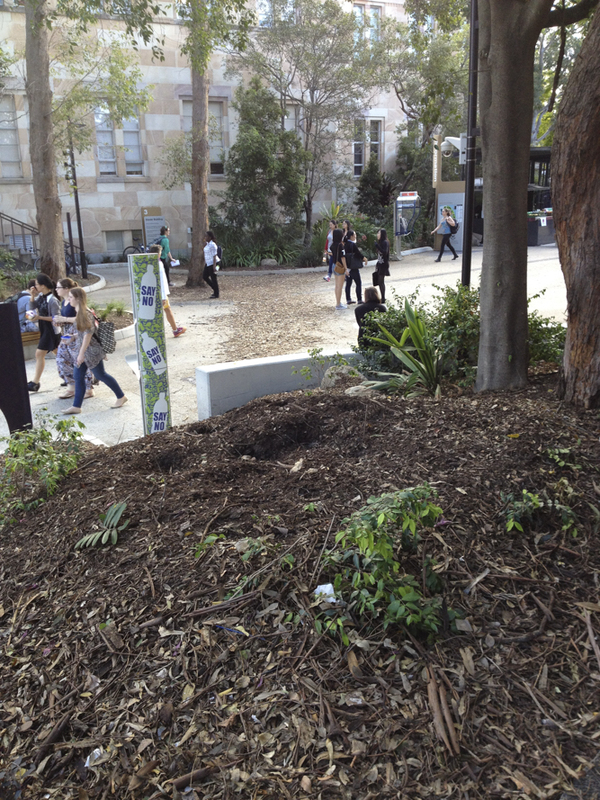 However, just like the urbanisation that is happening in Brisbane and beyond, “Turkey-tecturisation” is also making its presence felt further afield on campus with a broad swathe of bark detritus being swept across the path between the Steele (Geology Dept.) Building and the Commonwealth Bank where another nesting mound is being constructed. I wonder if the spread of Turkey-tecture will be limited after a human slips and falls on the bark trails, or if the freshly-hatched chicks stage a sit-in on one of the lecture theatres? Perhaps then some sort of building ordinance will come into effect restricting mound-building to Turkey-tecture zones that are segregated from human pedestrian traffic… or perhaps a compromise could be reached where pedestrian cross-overs or ramps, or Brush turkey underpasses could be constructed, allowing free segregated passage for both forms of bipedal transport (the soled and the clawed)? That would make for a for more interesting walk around campus wouldn’t it?